Daylight Savings Time just does not seem to save much daylight to me! 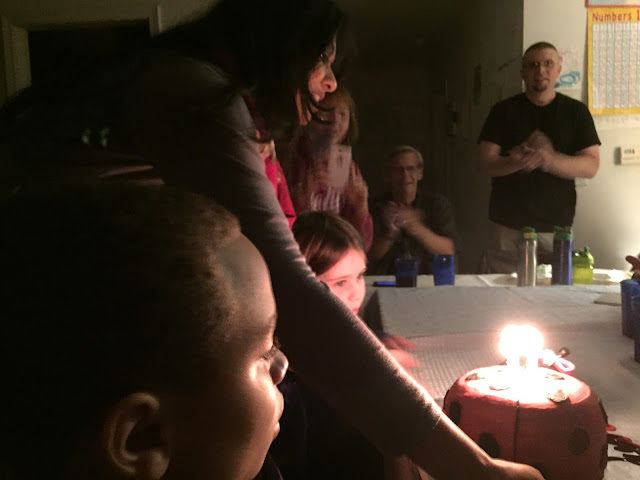 However, as our family dashed around turning on lights from room to room as Autumn days slid by, in quick succession, we celebrated three family birthdays in candlelight. This year our family friend Annie made and presented my oldest granddaughter Hayley with her 8th birthday cake which was in the shape of a very cute ladybug. 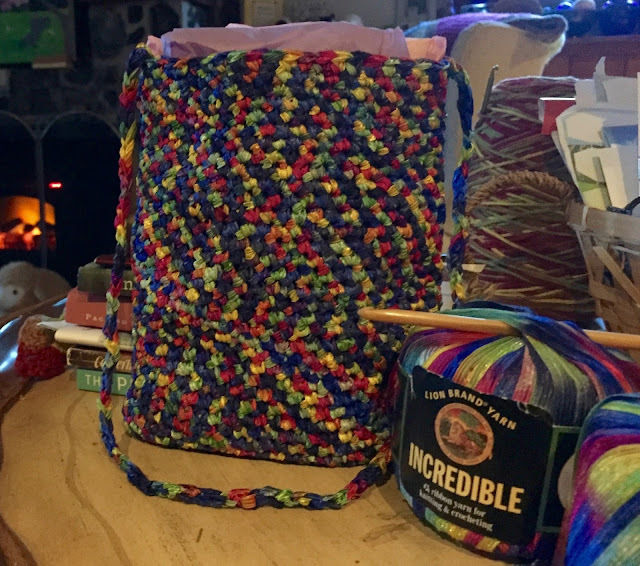 With variegated nylon ribbon yarn, I crocheted Hayley a little art project bag filled with a coloring book and a box of colored pencils. The day after I gave it to Hayley I heard urgent shouts from her parents, "Joy, stop!" I feared the worst, but discovered that the urgent voices were thankfully not due to a matter of life or death. Joy had just been slinging the art bag around and it began to unravel. Mercy! It did not take me long to single crochet it back into shape, but this time I did more than weave the end back and forth! 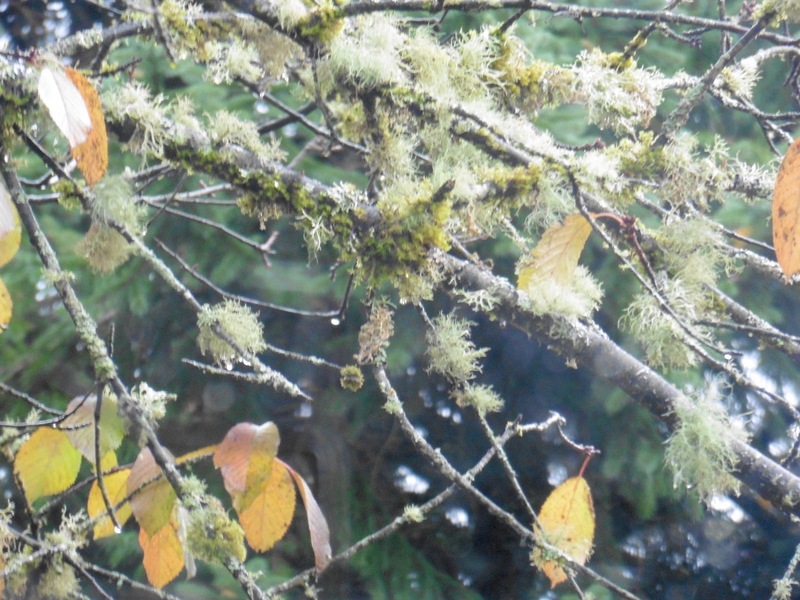 Frequently I have been awakening to see gray skies, and fewer and fewer green and golden leaves on our massive wild cherry tree outside my window. Water droplets clinging to the branches is a wonderful sight, sparkling, reflecting light...promising the end of our days of drought, as rain fills our ponds for water fowl to float upon and dive under to find food, and frogs to wiggle and leap through their life cycle. The weather has not only been conducive to stitching on various projects and reveling in the rain, but has also encouraged me to enjoy all sorts of reading, including some of the writings of Catherine de Hauck Doherty, who was born in pre-Communist Russia. She was a wealthy woman of title who then became an impoverished political refugee. She earned her way back into wealth in Canada and the United States, then gave up her wealth for living in the light of her faith in God, serving Him by caring for the poor. Little Rosie my youngest granddaughter recently celebrated her second birthday! We had a joyous celebration! In our world too often darkened with destruction, we care for those whose lives are impacted by that destruction and are investing in seeing and being light that dispels it with love. A beautifully written post. Lots of celebrations, belated birthday wishes to them all. Loved the bag, a wonderful gift. Take care. Autumn is birthday season for you, it's such a blessing to have little ones around you. It sounds like you've got plenty of things to keep you occupied now that the darker evenings are here, it's the same here, I just wish there were more hours in the day so that I could do everything I want to do. What a beautiful post, Gracie. 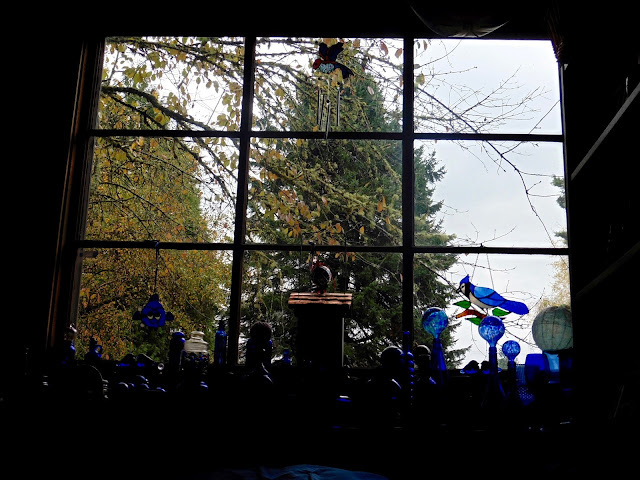 I love waking in the morning and checking what the light outside is like. Happy Birthday to your grandgirls! That was a funny story about the unraveling project bag. Happy birthday to Haley and Rosie I love the pictures. So sweet I'm sure she really likes that tote bag you made her. Precious gift from grandma. Our drought seems to be ending over here too. We even had some snow last night but it didn't stick around very long. Today it's rain and that's fine with me! I've been running around cleaning this morning but right now I'm sitting by the fire with a cup of tea, reading blogs and getting ready to crochet or knit. Have a wonderful day my sweet Gracie. Beautiful words, Gracie. I love the project bag you made your granddaughter - it looks like it was worked on a big needle which is my kind of crocheting. I'm enjoying this time of year and all the changes in the weather and the light. I "hang out" in my guest room a lot where the sun shines in so brightly everyday. What a joy. 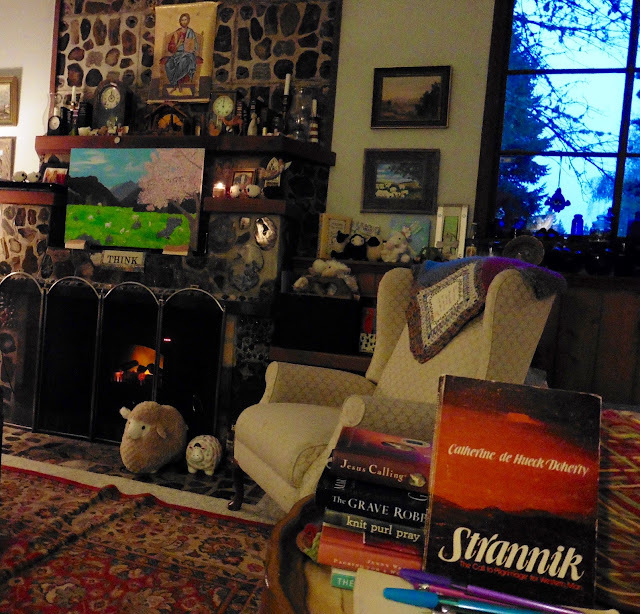 As always, your living room looks so cozy with your books and works in progress close by. Gracie, I am trying to get all caught up and I have missed you so much. Lots of wonderful things happening with your family, can that sweet baby be 2 already? 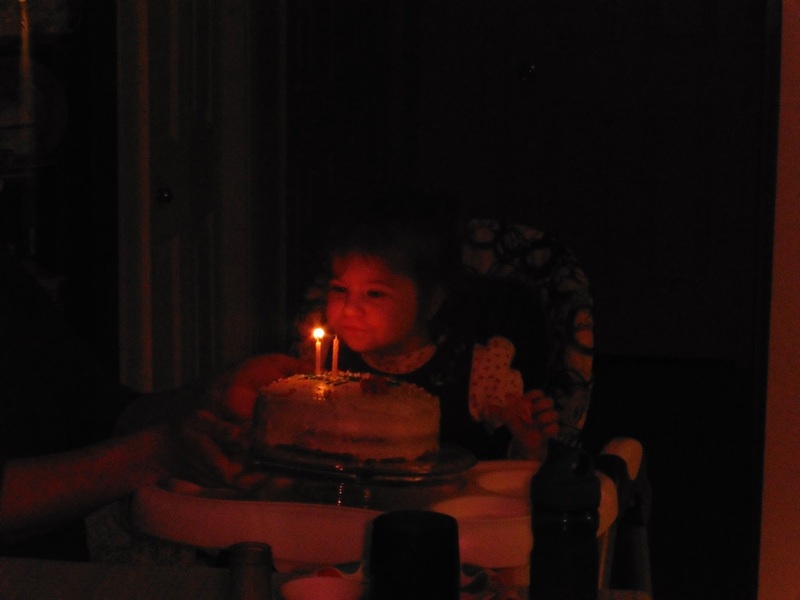 What a happy week, Gracie, with two happy birthdays. I'm not a fan of the dark myself but these long evenings can be very productive. Hi Gracie, as always, it's nice to see what you've been up to. I love the project bag, it's so cute. I'm glad to know it was easily fixed. I hope both birthday celebrants have a wonderful year. Take care and enjoy the rest of your week. Oh Gracie - such lovely photos! The children in the top one and the looks on their faces in the candlelight, how wonderful. I also, am coveting your chair by the fire - what a simply perfect spot!! Happy birthday to your granddaughters! Looks like a wonderful time of celebration! Very nice job on the art bag--glad to hear it didn't come apart too badly! Your home looks very cozy with the fireplace, and the book on Doherty sounds like a fascinating story. I'm not too fond of the end of Daylight Savings time myself--too bad we can't stay on summer time all year! What a lovely post and what a lovely occasion to celebrate. Your last word so resonated with me. Thank you. Your story about the art bag is quite instructive! If I ever have grandchildren, I hope I remember to make sure I secure all the yarn ends securely! So many happy times for your family. Thanks for sharing. Wishing you a happy weekend. Hello dear Gracie. I have missed you so! It always gives me a warm fuzzy feeling when I visit you. Lots of wonderful family things! And yarny things!!!!! I sure hope I can get back into a more regular blogging s he duel soon. Thank you for visiting me today! I welcome your comments!